The band was a prominent target in the mid-1980s of the Parents Music Resource Center (PMRC) led by Tipper Gore, wife of then-Senator Al Gore (D-TN), an organization that pushed for warning labels on recorded music. The band immortalized its fight with the PMRC on the song "Harder, Faster" from their 1987 live album, Live...In the Raw. In October 2007, W.A.S.P. embarked on The Crimson Idol Tour, to celebrate that album's 15th anniversary. It is the first time that the album, often regarded to be among the band's finest work, was to be played in full from start to finish. The tour kicked off in Greece, in Thessaloniki at the Principal Club Theater on October 26, 2007. It was also announced that this tour would be W.A.S.P. 's last tour for some time. However, the band already confirmed some European festival appearances for summer 2009. 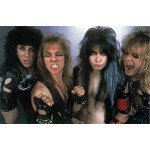 Blackie Lawless remains the only member from the original line-up. They released their most recent album in November 2009, entitled Babylon.